Having spent 4 months in Vietnam I’ve put together a brief Vietnamese food guide for beginners. A guide to what is best to eat and try in Vietnam and particularly Hoi An, a culinary capital in Central Vietnam. Vietnam is famous for numerous dishes such as Pho, Banh Mi and Com Ga which you’ll find the length of the country. 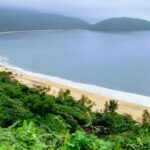 Others are regional specialities only located in certain parts of Vietnam. 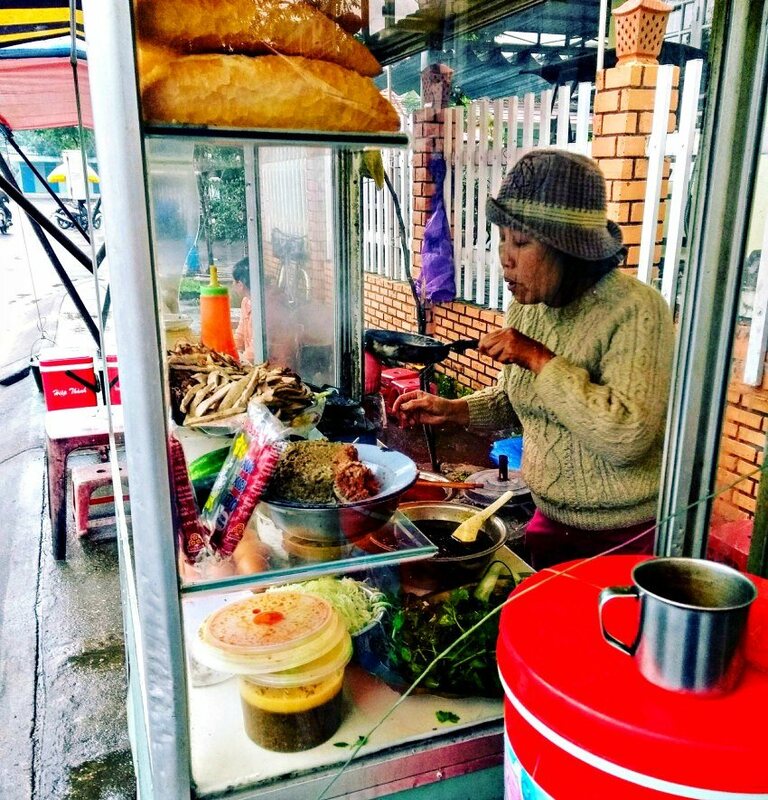 Each region of Vietnam has its unique version of dishes but street food is a constant as you travel the length of Vietnam. Grabbing a plastic stool at a roadside at any street food stall is one of the best ways to experience Vietnamese food and interact with the locals. 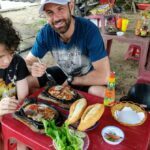 I’ve put this Vietnamese food blog together through trying everything we find as we travel around Vietnam. Our Vietnamese food blog, what to eat in Vietnam? We strongly recommend that you try every dish you can find. Sitting down to many Vietnamese dishes it will be accompanied by a bowl or plate of fresh salad leaves. These won’t always be the same as they use what is available at the market. The idea is you add these to the dish to finish it off and get those additional flavours. 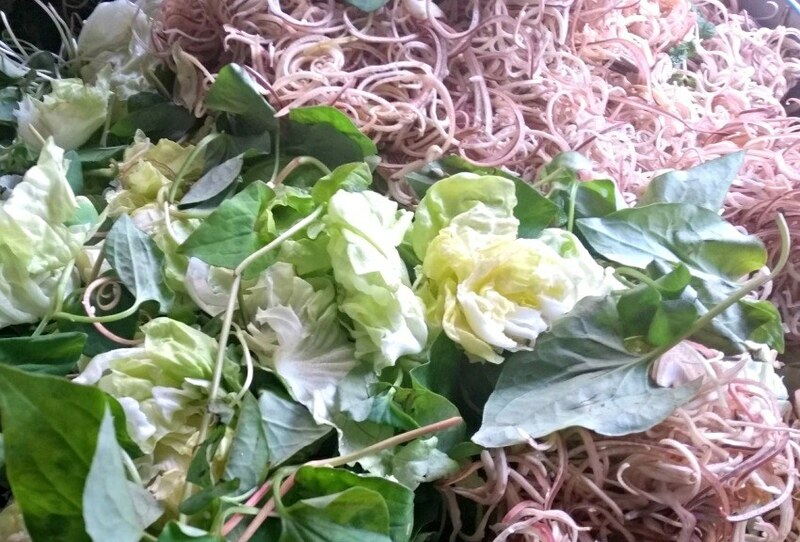 A picture of shredded banana flower/blossom with the ghastly tasting fish mint in the foreground. The banana blossom or flower as it is often called is harvested before they turn into bananas. First you take off the outer purple leaves and buds. It is then chopped in half and very finely sliced into lemon or lime water to avoid it discolouring. It is then added to numerous dishes and also the salad mixes so common in restaurants. Banana flower has many health benefits aside from tasting delicious. Packed full of vitamins and minerals its no wonder people use it all the time. We grow bananas in our garden so I’ll be trying this when we get back home. Fish mint is either a love or hate affair. I only know 3 people who actually eat it without complaint. For our family we pick through everything to make sure that it isn’t there. It looks almost heart shaped and solid green although there is another version outside Vietnam that has red on the leaves. Called fish mint it has no bearing on either how mint looks or tastes. The leaves tastes fishy and have a strong fish aroma. In a way that if an actual fish tasted like this you’d send it back for being’off’. I’ve only seen it used here in Vietnam and never in Vietnamese restaurants outside of Vietnam thankfully. Not restricted to Vietnam but here they are used everywhere. From dishes such as Mi Quang right through to just buying a bag to eat from the markets. You can buy them either raw or cooked and if they are cooked either peeled or not. Rice plays a huge role in Vietnamese cuisine but unlike other Asian nations it is rarely as plan rice. In fact they prefer rice noodles and rice paper. 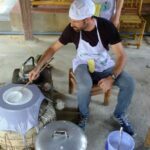 If you do a cooking class like we did they will teach you how to make the rice paper from scratch which is a vastly labour intensive task. 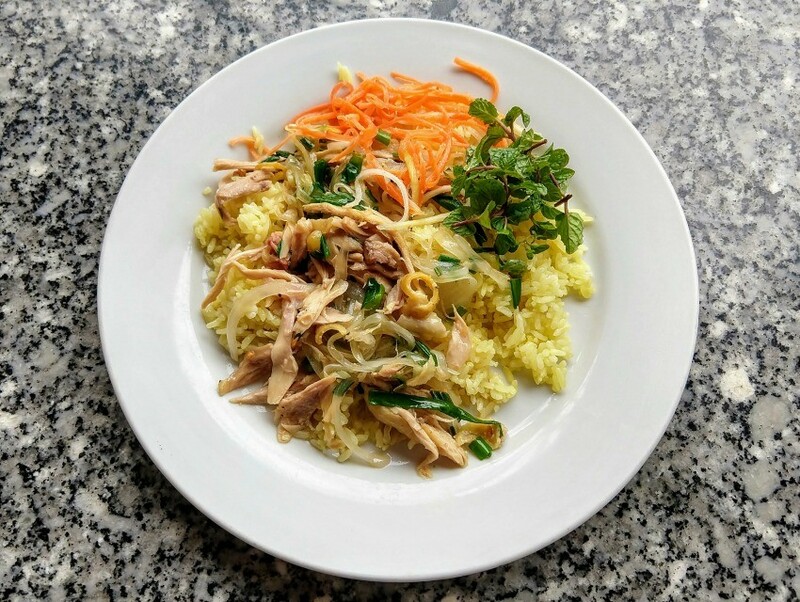 It makes a marked difference where rice accompanies everything in the majority of Asia restaurants and makes the Vietnamese cuisine much more enjoyable and diverse. 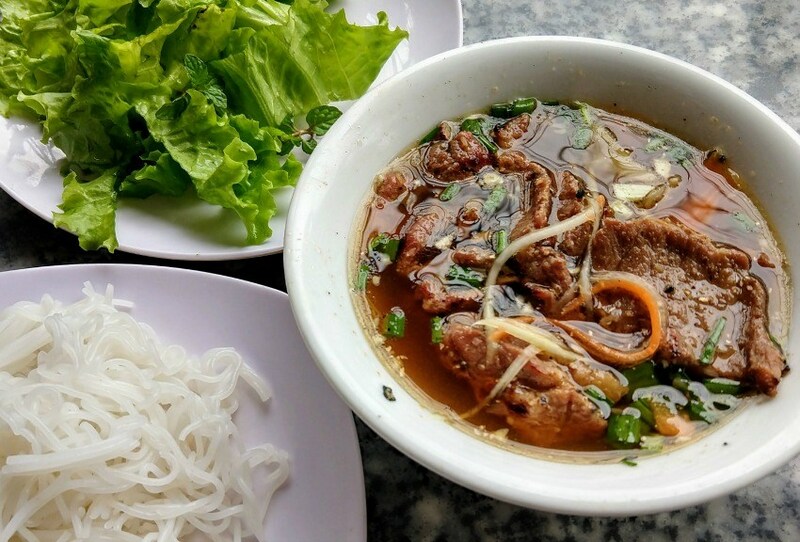 The cultural and economic capital of Vietnam is a big bustling city with a few region dishes that you’ll want to try while you’re in Ho Chi Minh City. With such great fresh ingredients on hand the foods of the south are heavy with fresh vegetables, herbs, meats and seafood. Even the Pho here is different from the original Pho of Northern Vietnam with much more fresh ingredients like bean sprouts and fresh herbs. Seafood and food from the Mekong waterways such as catfish feature heavily in Southern Vietnam. Hoi An is a thriving tourist town with a long history of different cultures that have over time put their touch into both the town and its culinary journey. From the Chinese, Japanese and the Vietnamese each group have added to the benefit of food in Hoi An. 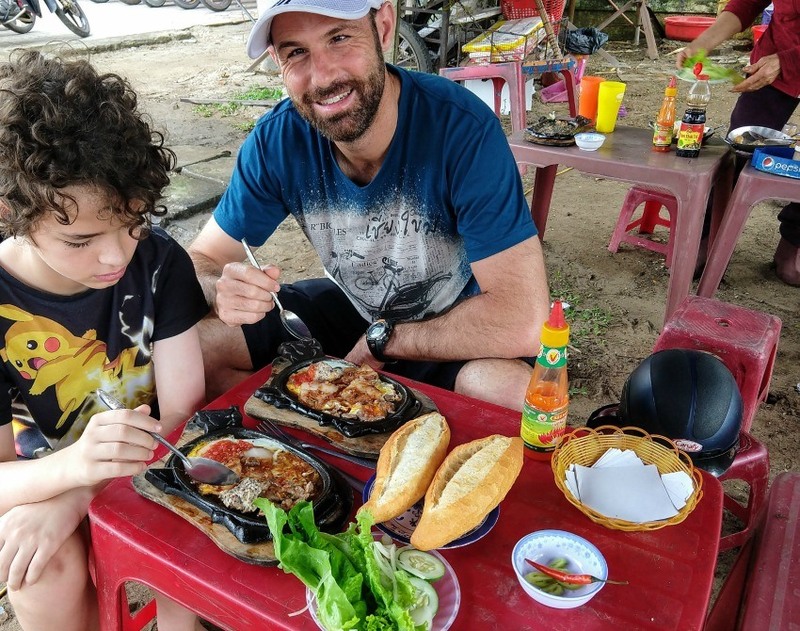 Here you will find several dishes that are not only local to Hoi An but you won’t be able to either make or buy outside of Hoi An. Cau Lao noodles are the greatest example as they can only be made from water from Balle Well located in Hoi An. With its close proximity to China the foods in Northern Vietnam and Hanoi take a lot from its northern neighbour. The French also played a large part in the food culture of Vietnam. 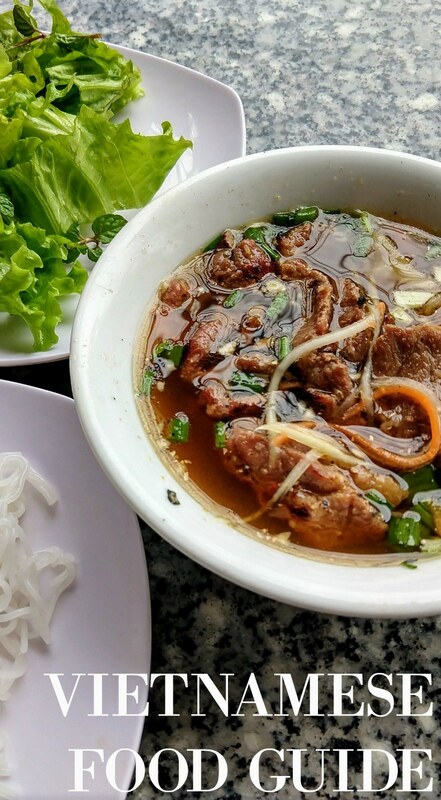 Vietnam’s most famous dish, Pho originated in Hanoi and northern Vietnam and while the exact origin isn’t written down it has been said it was influenced by the French dish pot au feu ‘Pot on the fire’. A French version of a hearty stew with beef bones and other ingredients not unlike Pho. Northern Vietnam doesn’t have the climate and the fresh ingredients of the south and this is reflected in what foods you’ll find up in Hanoi and the north. 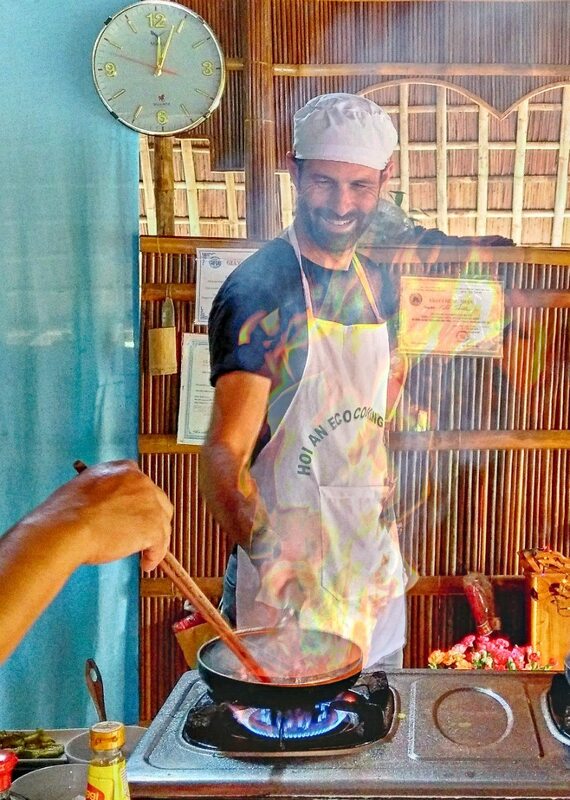 Participating in a Vietnamese cooking class is a great way to learn about local foods and culture. As a Chef this is something I do everywhere I can. Bun mam. Cold sweet and fishy, it wouldn’t be my first choice of food in Vietnam. Bun Mam is specifically a southern Vietnamese dish. As the name, Bun, suggests it is a noodle dish with a base of dark colored broth prepared with fermented fish sauce. The fermented fish ( or shrimp) sauce gives the soup broth a well balanced flavor and it’s not nearly as fishy as it might sound or smell. Like most noodle dishes the rice vermicelli noodles are placed into the bottom of the bowl before the broth is added and to finish an entire assortment of meats/seafood like squid, prawns, and pork are all scattered on top of the noodles. A slice or two of aubergine is put on top of a bowl of southern Vietnamese bun mam. Tamarind juice and sugar can be used to sweeten the dish if it isn’t to your taste. Getting stuck in to a Vietnamese breakfast, op la with banh mi at a roadside street food stall. Pho Bo which is found the length of Vietnam. But that doesn’t mean each and everyone is the same. You’ll see the difference as you travel up or down Vietnam with each area have slight and subtle changes. Arguably the most famous of Vietnam’s dishes, Pho originated in the north before spreading across the whole country as the Vietnamese moved south. The northern and southern Pho are different with the south having fresh herbs and sprouts where as the north misses these ingredients. Usually made with beef (pho bo) it can also be made with chicken (pho ga) but this isn’t as common place. The broth is made with the beef bones and charred onion, star anise and ginger. Garnishes include Asian mint, thorny corriander, lime wedges and bean sprouts. You’ll find Pho everywhere in Vietnam and in quite a few countries where the Vietnamese have emigrated. Banh Mi stand on the streets of Hoi An. The perfect place to grab a quick bite to eat. Vietnam’s second national dish is a sandwich made with a crusty baguette. Another influence from the French occupation of the 1900’s. Banh mi actually just means bread, a small person sized baguette, but the banh mi stalls generally serve sandwiches.The ingredients that go into making a traditional banh mi are pate, pickled carrot/daikon, fresh herbs, cucumber and pork belly slices. A soy based sauce or mayonnaise is also used. While this is the most common variety you can get pretty much what ever they have available. Egg or cheese is quite common if you are vegetarian. You’ll find banh mi across the whole country with regional variables specific to availability of produce. Watch out for MSG which is being used more and more in Vietnam and isn’t a nice additive. Cau Lau noodles, here with chicken. This “Mixing Dish” is more commonly found with pork but you can also find vegetarian versions with sliced tofu . This noodle dish is only made in one town in Vietnam. The noodles have to be made from the water from the Ba le Well which is located in Hoi An. 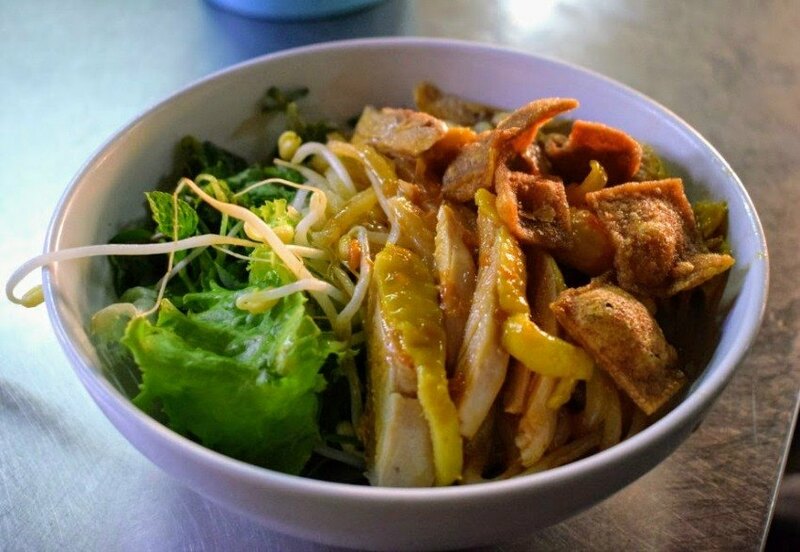 You’ll find this simple dish in all the restaurants around Hoi An and a few varieties such as vegetarian or chicken but if it has cao lao noodles then it is cao lao. The ingredients are placed in a bowl and it is the customer who will mix them together after serving, it is known locally as a “mixing dish”. The main ingredients are the noodles, fresh herbs, fried sesame wonton skins or prawn crackers and char sui pork pieces. It contains a small amount of sauce in the bottom, no soup, and often has an accompaniment of chilli jam. Banh tam bi is made with tapioca noodles again but is simpler with just herbs, pork slices and crispy shallots.The big difference is in the sauce which is a coconut cream dressing. They use a very liberal amount and it may not be for everyone. I personally love it as I’m a big fan of coconut. Found in Southern Vietnam it is most common in Saigon street stalls. Delicate white rose dumplings, a Hoi An speciality. These contain prawn but vegetarian versions can also be found. 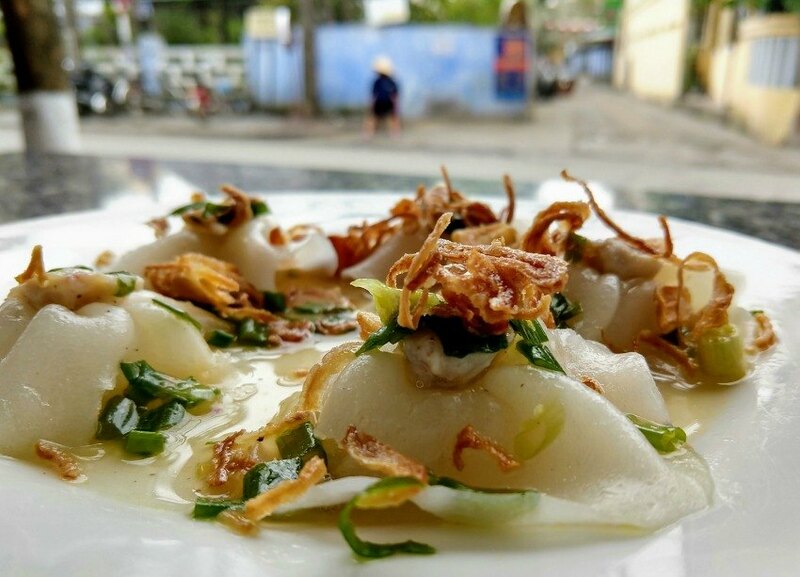 White rose is another local delicacy from Hoi An in central Vietnam. A shrimp dumpling made from a translucent dough, they are steamed and served with fried shallots and a dipping sauce on the side. They are said to all be made in one restaurant just outside the old town. A must visit restaurant that besides drinks only has two items on the menu. One of the only two dishes sold at the White Rose restaurant ( mentioned above) these little parcels of shrimp and prawn mix are deep fried and then covered in a salsa of tomatoes, corriander, cucumber and sometimes pineapple. It is worth noting that not all of the restaurants put the shrimp mix inside. Quite a few restaurants in Hoi An didn’t have the filling. Rumor has it that when a milk shortage occurred in Hanoi in the 40’s an enterprising young barman turned to egg yolk as a substitute to the hard to find milk. It has become more of a dessert these days with not just egg yolk added. It now includes Coffee powder, condensed milk, a little butter and cheese. With this drink you’ll either love it or hate it and if you’re thinking it tastes like western coffee you’ll be somewhat disappointed. But if you’re in Hanoi you must try it at least once. Bún riêu is a traditional Vietnamese meat rice vermicelli soup served across southern Vietnam and especially in the Mekong region. A tomato and meat based broth and noodle dish. 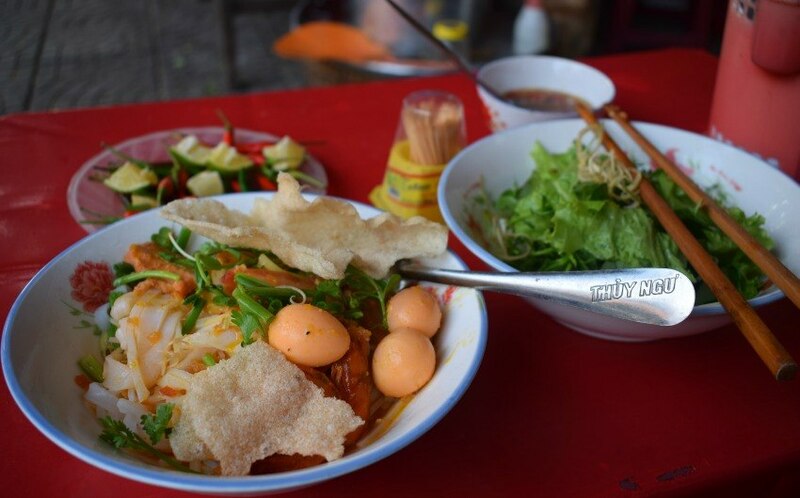 The most common variation is Bun Rieu Cua which is garnished with freshwater crab found in the rice paddies. The crab is then crushed up including the shell into a paste before being added to the broth. A Vietnamese noodle dish with a difference. The direct translation is cake soup given that the noodles are made with tapioca or a mix of rice and tapioca flour. The noodles are cut from the large block of uncooked dough hence the word cake. There are lots of variations on this such as banh canh cua which is with crab, banh canh cha ca which is with fish cakes from southern Vietnam and banh canh gio heo tom thit which has both pork knuckle and shrimp. Which ever version you have you’ll have a full hearty soup base thickened by the tapioca noodles. Not a dish but actually the name of sea snails. Quan Oc is the name given to a restaurant serving snails of all shapes and sizes plus blood cockles, clams, and often shrimp and crab. Found in Saigon you’ll also find them along the coast of Vietnam. Big tanks out front will display the live seafood available for the day. Pick your favourite and then decide how you want it cooked. Steamed, roasted, grilled or BBQ. Simple as that. Plastic tables and tiny stools, perfect mi quang. This dish is perfect in every way. This central Vietnamese dish is one of the most famous and popular especially in Hoi An and Danang. Seen in the street stalls across the region it is a brilliant way to start your day. The dish is made with white rice noodles, pork slices, unpeeled prawns, sesame rice crackers, peanuts and two cooked quail eggs. A broth is poured over the noodles and meat to add flavour and finish the dish. Herbs, lime, banana flowers and chilli is served as an accompaniment. Read my indepth review of mi quang here. Take your piece of crispy banh xeo , place it on a sheet of rice paper, add salad and herbs, wrap and dunk. Banh xeo translates as sizzling cake due to the noise the batter makes when you pour it into the pan. 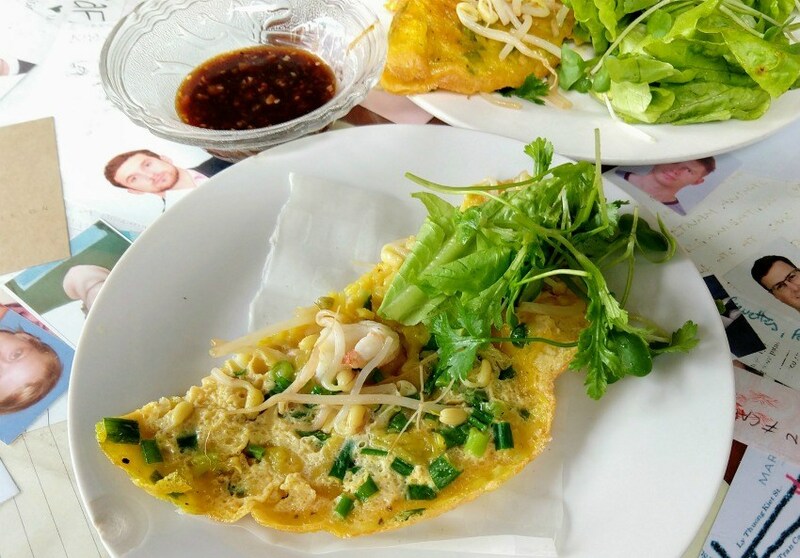 This dish is a multi part dish with the pancakes of prawn (and or pork) being cooked and brought out to the table along with salad, rice paper and a dipping sauce. You wrap the pancake with cucumber and fresh herbs inside a rice paper and finally dip it in the dipping sauce before eating. Served from restaurants to street stalls be aware that the prawns won’t be peeled in the street stall variety but are small enough to eat with the shell on. The dipping sauce is traditionally a nouc cham, a sweetened fish sauce. Interestingly the further north you go the smaller the pancake gets. In some parts of Saigon they are almost dosa size. These little pancakes are like banh xeo’s little brother, small bite size pancakes that have the shrimp, vegetables, herbs and bean spouts on top ready to eat. They are served with a spicy fish dipping sauce. Cooked on the same griddle as the Thai sweet version these are instead savoury. Perfect for a snack on the go. Bot chien is a rice flour cake similar to others found across Asia. Made only with tapioca starch and rice flour, they are cut into small pieces to be fried up with loads of oil or fat and other ingredients that make up the dish. This includes eggs, pork and shallots which are all cooked on a hot skillet together to make an almost omelette style dish. Garnished with dark soy and either herbs or green papaya. It very much reminds me of the oyster omelettes at the markets in Thailand. Goi Cuon are one of my favourite snacks in Vietnam. You need to try them to believe just how good they are. 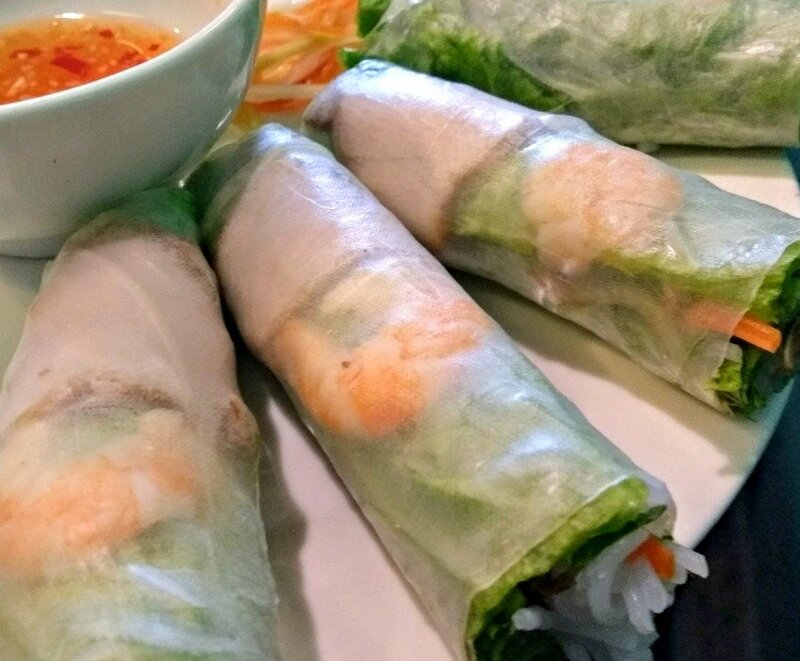 These uncooked rice paper spring rolls are found the length of Vietnam from restaurants, street stalls and markets. The dried rice paper is just dunked in water and then laid flat with ingredients placed on top before rolling into a cigar shape. They will contain either pork, prawns or vegetables. With fresh herbs and other local ingredients inside. They are served with either a sweet fish sauce dip and /or a hoisin and peanut dip. Great for a snack on the go or as a starter to share. Bun moc is another soft noodle dish much like pho but without the spices. The broth is clear with a quite plain taste that is made with both shitake mushrooms and pork bones. They also serve a piece of bone with the soup. Expect the usual ingredients of corriander, fried shallots and of course various precooked pork slices to garnish the finished product. Sold at various street stalls in Saigon and the south. The Vietnamese are crazy about com ga, chicken rice. The sharp crunchy pickles are a nice contrast to the richness of the yellow rice and chicken. Com Ga is best with added chilli jam. Simply translated as chicken rice this dish is everywhere across Vietnam from bus stops to restaurants and everywhere in between. Quite a boring dish by comparison to the wealth of great food that the Vietnamese have it still has its place if you want something simple. Look around and you’ll see a few variations depending on location. The high end restaurants will probably do it in a totally different way to the bus stop. A word of warning if you don’t like chicken skin, the chicken is usually steamed with the skin on resulting in a gelatinous texture. I personally hate this but others love it. Sweet, savoury, richly flavoured bun cha. This last dish originated in Hanoi in the north of Vietnam. It is a dish of grilled fatty pork served up with a sweet broth/dipping sauce over thin white rice noodles. It gets a garnish of fresh herbs and banana flower to finish. Hanoi people will eat this dish by putting all the ingredients into the broth and then eating it like a pho. People from the south will sometime wrap everything in a large lettuce leaf and then dip it back into the broth. The choice is yours. This was President Obama’s favourite dish when he was in Vietnam incidentally. As the name suggests this is a beef noodle soup from the old imperial town of Hue in central Vietnam. Bun bo is a balance of spicy, sour, salty and sweet flavors with a strong lemongrass flavour. Made with rice vermicelli noodles and having the spice that a traditional Pho Bo doesn’t this is a great substitute or if you just fancy a change from pho. Pig blood coagulated cubes are also included sometimes so check out what they use before you order if that isn’t to your liking. 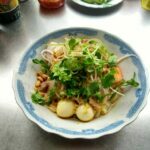 Thanks for reading my Vietnamese food guide for beginners. I’ve enjoyed tasting all the dishes and writing up these brief guide. Stay tuned for more in depth posts about Vietnamese food in the coming weeks. Hi Chef, we have booked to go to Vietnam for the month of july. My biggest fear is my husband has a severe allergy to shellfish (anaphylaxis) whilst i asked your lovely Alyson about this last summer i thought id ask again as your there and have been immersed in their food culture. We plan on doing hanoi, halong bay, sapa, ninh binh, phong nha and end in Hoi an. I suppose my question is, is there anything safe to eat that isnt at risk of contamination? If a street stall did only a vegetarian dish or a specific pork dish is there still a risk? Im thinking street food might be safer then a restaurant if they specialise in one dish or is that crazy? Thanks for reading the post and we are definitely enjoying the food culture here. 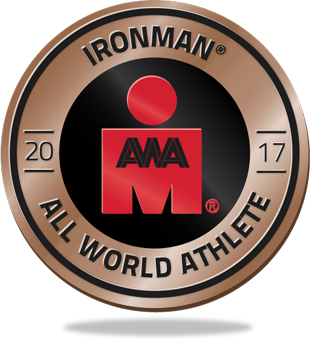 Having spent months eating out at various different restaurants and street stalls I’d unfortunately say it will be tough. Very tough. Shellfish is a large part of their diet in various ways. Not just in the boiled or grilled crab way but in the sauces and stocks. 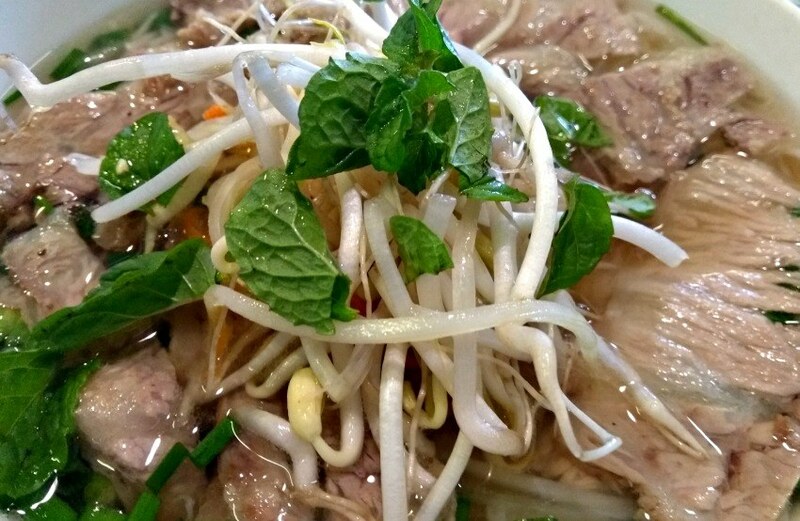 Pho shops will probably be your best bet as that is all they do. While the Cau Lau shouldn’t have anything it is normally always made in a shop with Mi Quang which has shell on prawns on top. While 99% of their hygiene is impeccable and we’ve never been sick that isn’t the same thing as making sure there is no cross contamination as you’d know. We did a cookery course and they did separate a couple who had and allergy and were very good with it as they knew in advance. If you can get a card with everything written down your husband can’t have in both English and Vietnamese that would be a massive help. Not just shellfish but list them all individually such as crab, prawn, lobster etc. The good news is that the north has less seafood as a whole than the south. Good luck with your travels. I’m sure you’ll love your time in Vietnam. Thanks for reading Mike, Yes I love the food and I think food is such a focal point of the Vietnamese culture. I’ll be interested to see what else you try on your next visit and what you like and perhaps dislike. Hi, what did you liked in Vietnam the most? It seems that you had a wonderful time there. And how come that you decided to visit this country? Thanks for taking the time to read the post. My two favourite things about Vietnam were the warm welcoming people and the great food. Have you visited Vietnam yourself? If not you you must visit this wonderful country. I’m so jealous here. I love Vietnamese food though it wasn’t until we went there 3 years ago did I realize that there was so much more that what restaurants were serving back here. Just their variety of noodle soups alone is enough to keep me happy everyday. Yes being in Vietnam was certainly great from a health point of view. The food wasn’t just great for your body but also tasted brilliant. A win win. I agree with the variety you can get in Vietnam compared to back in the west. Much more variety. Hoi An being one of our favourite destinations in Asia. 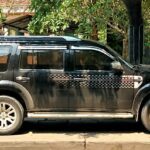 Hi chef thanks a lot for sharing this amazing blog on delicious Vietnamese cuisine.The Asian cuisine is quite popular among the tourist specially the Vietnam cuisine which includes some of the most popular & delicious dishes in the south Asia like bun rice quon,banh cuon,bun cha,pho,These dishes are loved in the entire vietnam. 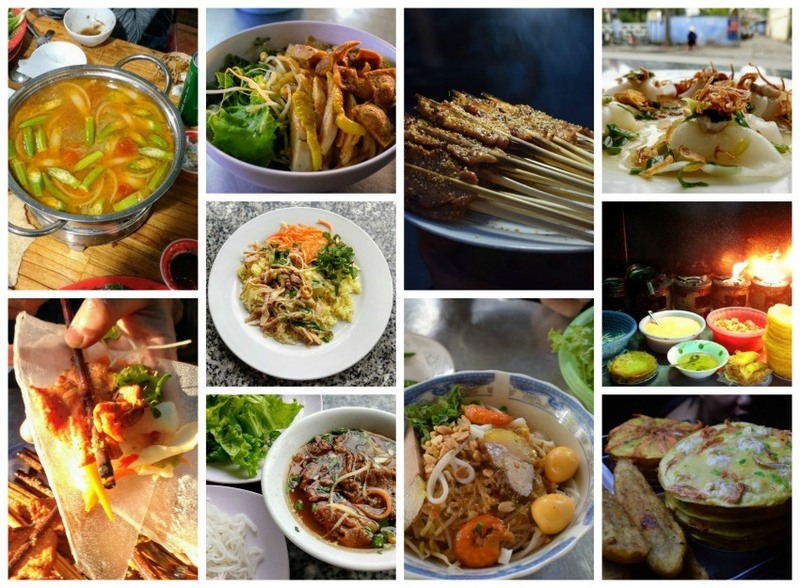 One must try out these amazing dishes when travelling to Vietnam. Thanks for sharing your experience. I will try if i got chance to visit their. I think street food might be safer then a restaurant if they specialise in one dish or is that crazy? Thanks for reading Julian, I don’t think it will make much difference. I always have a look at the restaurants first before sitting down to see how clean they are. Same with the street stalls. Just make sure the food hasn’t been hanging around a long time. Having spent a lot of time in Orange County, I thought I knew a lot about Vietnamese food, but I just scratched the surface. What does the banana blossom taste like? It sounds so interesting to eat what would eventually turn into a banana. and try it if you get the chance. 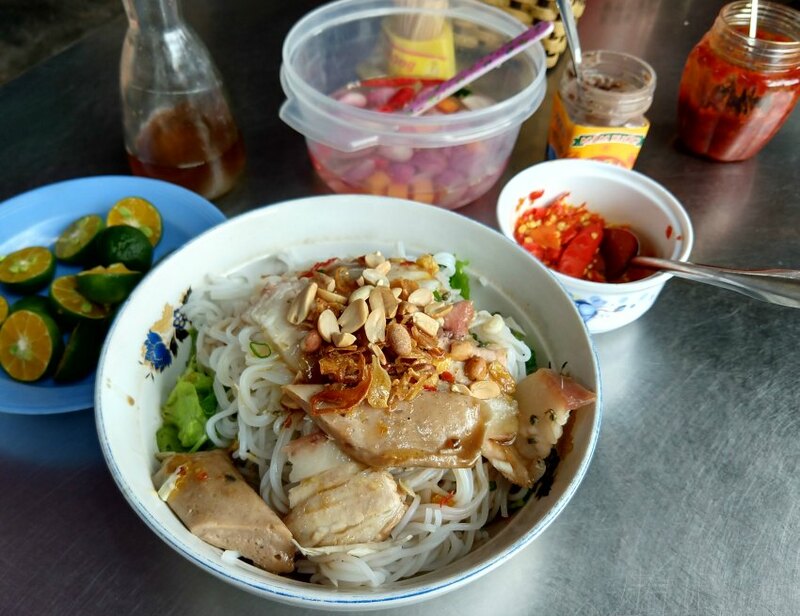 I think you should try Beo Nam Loc – a special food of Hue city. It’s so delicious. Wow my mouth is watering big time! Cant wait to try the white dumplings, great article thanks! The advice given, is only drink bottled water. My first time travelling in the far east, and cant help wondering about the safety of eating raw foods… and salads – I presume washed in ordinary water. And in the Uk, shell fish can be suspect. Do they just have a better understanding as it is used so much? The dishes sound so tempting but not so good for a veggie diet? Will only be there two weeks. THanks for reading. Yes in Vietnam only drink either bottled water or purified water (our house in Hoi An had purified which cut down on the plastic) It is dependent on the restaurant but most will wash the fruit and vegetables in purified water as locals won’t want to get sick either. As this is your first trip to the far East you may find that your body isn’t used to the germs and bacteria there. I’d be careful but don’t let it ruin your holiday. As for the shell fish in the UK, things like prawns are normally from Asia and the water they are caught in may not be the cleanest. Shell fish filters the water so if it is dirty then the shell fish will pick that up. Wow your food photos are awesome and they actually make you feel hungry. I would definitely love to try Vietnamese food. They look so yummy. 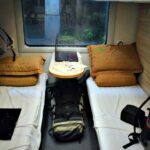 I’ve been thinking of traveling more through Southeast Asia because I loved it so much last time we went. Although we only visited HK, Taiwan, Korea and Japan, so I did miss out on quite a few good ones. The closest I’ve gotten are Vietnamese restaurants in the states, though my friends say the authentic flavors taste so much different when you actually go to Vietnam. At health food stores, customers are complaining about food allergies more often now with statements like, “I can’t eat this”, or “I can’t eat that.” Why do so many people, especially those who frequent health food stores, believe they have food allergies? It’s funny, I’ve never heard anyone say, “I’m allergic to coffee, cookies, cakes, popcorn, pizza or candy”, and yet these are things that people ingest regularly without a second thought.